RBTH presents a selection of views from leading Russian media on international events, featuring reports on an unusual initiative to limit the consumption of alcohol in St. Petersburg and forecasts of a slide further into recession for Russia, as well as analysis of whether Moscow is planning ground support for Syrian leader Bashar al-Assad. The centrist broadsheet Izvestiya reports that officials in St. Petersburg are proposing to ban the sale of alcohol on Wednesdays. The bill has been developed by St. Petersburg Legislative Assembly Deputy Andrei Anokhin, who thinks that Wednesday should become a "day of sobriety" in Russia's so-called cultural capital. "Wednesday is the middle of the week and it is very important that in this period citizens stop drinking alcohol and focus on work," added Anokhin. "Furthermore, Wednesday is a day of fasting when Christians are busy with more spiritual matters." Anokhin sent the proposal to all the heads of all Russia’s administrative regions, requesting their support for the legislative initiative. Currently, the sale of alcohol in Russia is restricted to between 11 p.m. and 8 a.m., and regional authorities have the right to establish additional restrictions. 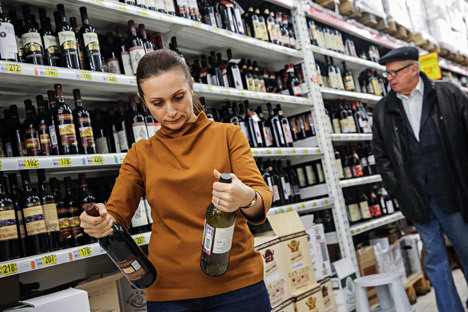 Yekaterina Kumaninna, director of external communications at Dixy, a large supermarket chain, believes that more attention must be dedicated to the fight against the illegal trafficking of alcohol. "It is the illegal trafficking of alcohol that does most damage to the country's economy and to citizens' health," she said. "Experience shows that legislative restrictions on the legal market do not lead to a decrease in consumption, but only to increasing the share of the illegal market, which lacks quality control, age limits and fiscal obligations." The RBK newspaper writes that according to the International Monetary Fund (IMF), the recession in the Russian economy will continue. The IMF's forecast for the development of Russia's economy in 2015-2016 is worse than before. The World Economic Outlook published on Oct. 6 says that in 2015 Russia's GDP will decrease by 3.8 percent, while in 2016 by another 0.6 percent. IMF experts note that the continuing decline in the Russian economy is related to the impact of factors such as low oil prices and the international sanctions imposed on Russia over its role in the Ukraine conflict, as well as to previously existing "structural weaknesses." Earlier, experts from the Moody's international rating agency predicted that in 2016 Russia's economy will shrink by 0.5 percent or even by 1.5 percent. Moody's announced that among the reasons for the deteriorating condition of Russia's economy are the low oil prices and the continuously weakening ruble. In turn, experts at HSBC expect Russia's GDP to drop by 4 percent in 2015 and by a further 2 percent in 2016. "The two-year recession will become Russia's longest in the last two decades, leading to the fall of domestic demand by almost 10 percent due to the drastic reduction of consumption and investment," said HSBC. The centrist newspaper Nezavisimaya Gazeta writes that Moscow has denied American mass media reports of Russian preparations for a ground operation in Syria against Islamic State (ISIS) militants. However, the Kremlin has not denied a CNN report about the deployment of a Smerch BM-30 Multiple Launch Rocket System (MLRS) between the Syrian towns of Homs and Idlib. Yet Lieutenant General and military expert Yury Netkachev believes that they may belong to Syria, not Russia. "If the MLRSs are spotted far from Russian positions, they could be Syrian Smerchs, which Russia probably gave to the government forces as part of the military-technological cooperation between the two countries," said Netkachev, though he admitted that these systems may also be Russian. "Anyone familiar with military affairs knows well that four MLRS systems are not enough to conduct a ground operation against terrorist groups, which in Syria consist of 70,000-100,000 fighters,” he said. The expert is convinced that the Smerch units are necessary for protecting infrastructure including Russian military sites and units that service the Air Force’s combat flights. Furthermore, Russian President Vladimir Putin's press secretary told journalists on Oct. 6 that the Russian government will not support volunteers who wish to go to Syria and fight on the side of Syrian leader Bashar al-Assad, since this is the government's function.